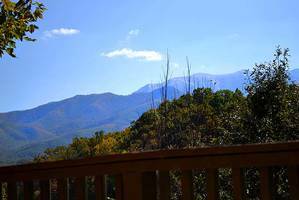 A couple's or Honeymooner's Favorite Gatlinburg Cabin Rentals! 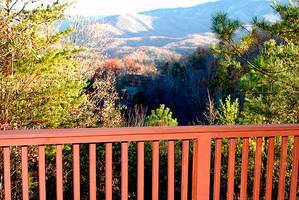 Enjoy one of the PRETTIEST MOUNTAIN VIEWS in all of Gatlinburg, end of road seclusion, off the beaten path and the all-natural cedar aroma. 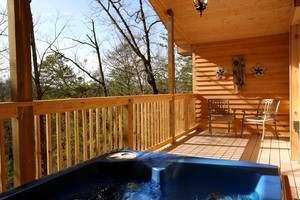 A TRUE CEDAR LOG CABIN--Natural Cedar Log Cabin located in Gatlinburg, TN about 10 minutes to downtown Gatlinburg. 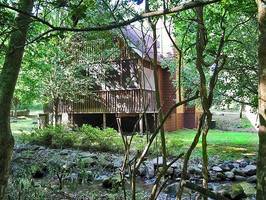 Secluded Gatlinburg, Cabin Rentals. The main level bedroom hosts a huge, two-person oval shaped jetted Jacuzzi tub sitting in a bay window overlooking a beautiful mountain view, king bed, huge flatscreen TV, fireplace with separate dressing area. The upstairs loft features a king bed with a beautiful view of the mountains, fireplace, huge flatscreen TV & extra large full bath. 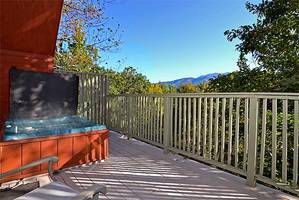 Perfect for Gatlinburg honeymoon cabin rental, Gatlinburg honeymoon hideaway, couples or small family, anniversary, birthday or Gatlinburg getaway. Maximum occupancy: 4; Roads & driveway: Curvy and mountainous; best suited for front wheel drive or 4x4 SUV; last mile is curvy and steep, but the mountain views are worth it! We had an awesome time! Thank you! We had a wonderful stay at Honeymoon Hills! Our cabin was perfect. The view was beautiful and the staff was very helpful and caring. Thank you for a wonderful stay. We had a great honeymoon! We are here for our honeymoon. We loved the cabin. Ziplining was alot of fun. We recommend a hike through the gorgeous Great Smokey Mountains National Park. The views are to die for. Our favorite part was seeing a baby bear in a tree. We had a spectacular time! We had a great time and really enjoyed our cabin. It was nice, relaxing and we don't have any complaints. This was our third trip to the mountains and we enjoyed it. There is so much to see and do. We visited Clingmans Dome, walked and shopped in Gatlinburg and ate at the Alamo Steakhouse. It was a bit expensive but worth every penny. We came to Gatlinburg to celebrate our one year anniversary. We loved playing Mini Golf at Ripley's and moonshine tasting at Ole Smoky Moonshine. We enjoyed eating at the Pancake Pantry for breakfast. We loved our dinner at The Peddler. It was over the top! They had a great salad bar and steaks. We can't wait to come back. We came to Gatlinburg for a family vacation with our 4 year old and 2 year old. Our cabin, Little Women, had just the right amount of space for our family. Some of our favorite activities were the Smokey Mountain Deer Farm, the Exotic Petting Zoo and picnicking at Greenbriar. The kids loved it. We can't wait for our next Smokey Mountain vacation! We had a wonderful time celebrating our 8th wedding anniversary. The cabin was excellent! We so enjoyed visiting the Titanic and Ripley's Aquarium. The bbq dinner at Bennett's Bar-B-Que was so filling. Thanks so much for everything. We truly enjoyed your beautiful state. We had a great stay. The cabin had nice views. We loved all the special touches and the privacy. Visiting the Smokey Mountain Riding Stables and The Comedy Barn was enjoyable. This was a great way to celebrate our 4th wedding anniversary. We will definitely be returning. We had a wonderful time. Our cabin was extremely clean and the hot tub was awesome. We were married here and was very pleased. The minister spoke kind words, the photographer was awesome and the entire staff made us feel very welcome. We have stayed here at Honeymoon Hills twice and hope to stay many more times. As I said the first time, "when the work gets slack, we will be back". This wasn't a special occasion for us. we just needed to get away. We like the quiet cabins and nice people. We also like the Hollywood Wax Museum and driving through the mountains. We enjoy eating at all the different restaurants and love them all. My husband and I came up for our honeymoon and we loved it. All the little touches that are in the cabin give it a romantic atmosphere. Since we booked with Honeymoon Hills we were able to enjoy many things in Pigeon Forge and Gatlinburg. They give you one free ticket to 12 different attractions. So we just had to buy one ticket. That saved us a lot of money. We plan to return each year for our anniversary. I would give this place 5 stars! They made our honeymoon memorable and we will definitely be back. We decided to come to Gatlinburg for a family Christmas getaway. I was very pleased with the hospitality offered by Honeymoon Hills staff during the booking process. The lady was very kind and informative. When we arrived at the cabin the atmosphere was very cozy and felt like home. The cabins amenities perfectly suited our family. I loved how the cabin is just far enough away from the busy town to feel private but close enough to things we needed without being inconvenienced. Our family would definitely recommend a stay at the Little Women cabin. We will be back for another getaway that feels like home away from home. My wife and I came here for our 10th anniversary. We had intended on spending a lot of time in town at all the attractions but we never made it. We loved the Little Women cabin so much we only went to town for groceries. 5 stars from start to finish! This was our fifth trip to Gatlinburg. We had recently gotten engaged and wanted a weekend away from reality to relax. I had never heard of Honeymoon Hills but the second I saw the name on the internet I was interested. The lady who helped me over the phone was super sweet and very easy to deal with. Being a Paramedic, I didn't have much money to play with so when I saw the price I jumped on it. From the moment we walked in we were in heaven. We spent our days in downtown Gatlinburg but at night all we wanted to do was enjoy our amazing cabin. It is without a doubt the best place we have ever stayed. We will definitely be visiting Honeymoon Hills again. We came to Gatlinburg for our honeymoon. We visited Ripley's Aquarium and it was awesome. We ate at Loco Burro Fresh Mex Cantina in Gatlinburg. It was great and the service was good. Our cabin, Little Women, was clean, spacious and absolutely beautiful. The beds were nice and comfortable. The fireplaces made it romantic and we really enjoyed ourselves. Thank you Honeymoon Hills for such good service. We will definitely stay here again. We came to Gatlinburg for our honeymoon after we were married September 26th. Our stay in the cabin was amazing and we could not have asked for anything better! We didn't plan to get out and do very much but we ended up spending quality time together and building a stronger bond between us. Texas Roadhouse had the best steak that I had ever had. We don't have that many restaurants to choose from in our small town. We were also able to get out and buy clothes for our 9 month old son. We came to Honeymoon Hills for our honeymoon. It was very nice to get away and enjoy some peace and quiet. Gatlinburg is lovely. There is something for everyone. We particularly enjoyed horse back riding and the walking trails. We honeymooned here in Gatlinburg. Everything was beautiful. We loved Ober Gatlinburg and our favorite dinner spot was Bubba Gump. Our cabin was wonderful, cozy and clean. This was our first time ever to the mountains and it was absolutely the best time we have ever had! We will most definitely be back next summer. Thanks for a great and welcoming stay. My husband and I had just gotten married on August 22 after being together 6 years. It has been a dream of ours to honeymoon here in Gatlinburg. The mountains are the most beautiful, relaxing and romantic choice for a honeymoon. Our cabin is cute, cozy and perfect for the two of us. We loved the jacuzzi and our private hot tub. Pigeon Forge has tons of attractions and fun things for couples to do. You never run out of things to do. It was an amazing experience and we are already planning our next vacation here. Our cabin was quiet, clean and very beautiful. We loved every detail right down to the champagne flutes. We came home from Alabama to honeymoon in Gatlinburg and it was perfect. We really enjoyed eating pancakes, lol. We hiked the Chimney Tops Trail, saw a baby bear and loved riding the sky-lift. We will definitely be back soon! The Little Women cabin, the setting, and the whole area was beautiful. We have been to Honeymoon Hills several times before but I've never written a review. We will be going again this spring, and we recommend this place and Gatlinburg, TN to anyone. 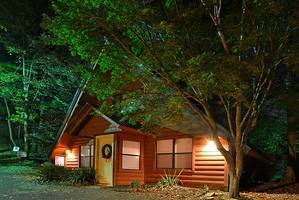 We have stayed several times at Honeymoon Hills cabins. So far we've stayed in Precious Moments, Little Women, Lazy Days on the Creek, Enchanted, Midnight Fire, and Serenity. All the cabins have all been excellent, clean, quiet and peaceful, the grounds are very well kept. 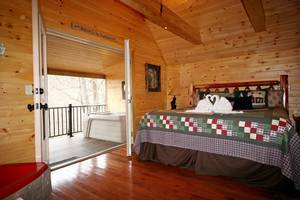 Honeymoon Hills is a great choice for a romantic getaway, or if you have a family, the larger cabins are great too! Everything was great! Thanks for everything. Jenny gave us perfect directions and was great. The only suggestion I have is maybe you could make brighter road signs, it was a little hard to read signs in the dark. We loved it here and will visit Honeymoon Hills again! Amazing cabin and very courteous staff at Honeymoon Hills. We are returning this fall and will be staying with you! The cabin was very secluded and quiet; very private and personal. We enjoyed each day we stayed! The cabin was very accommodating and we would recommend this getaway to other married couples who want to get to know each other more. Thank you for our enjoyable stay at Little Women! My husband and I chose Gatlinburg for our honeymoon. I searched the internet for cabins and found Honeymoon Hills. I liked what I saw, so I decided to book Little Women cabin. I was hoping everything would be what it said on the internet and what the staff told me when I was booking everything. When we actually arrived it was everything and more! Our cabin was beautiful! There were breathtaking views everywhere we looked. It was so peaceful and relaxing. It was just the thing we wanted and needed after the stress of planning a big wedding. The only thing we were not happy with was having to return home to reality! What a pleasant surprise! My wife and I have traveled extensively and were somewhat apprehensive about booking a wedding for our son without first seeing the property. Honeymoon Hills exceeded our expectations in every way. Their wedding went as smooth as silk and we plan on returning to our 'Little cabin on the Mountain' soon to renew our own wedding vows! My family recently stayed in the Little Women cabin. It was a great cabin with a wonderful mountain view. You could see for miles into the mountains. We spent days traveling around the area and enjoying the attractions but were so glad to get back to the cabin. It was a wonderful place to relax and enjoy family time. Thanks Honeymoon Hills for a great vacation! We are already looking forward to returning. My husband and I stayed with Honeymoon Hills in the cabin Little Women a few weeks ago. The cabin was very nice, very clean, and very spacious. We enjoyed the hottub outside. It was plenty hot with lots of privacy. We loved that both bedrooms along with the living room had fireplaces. It made the rooms so cozy. The kitchen was plenty big to make what few meals that we did. Last but not least the view was AMAZING from the front porch of the cabin. We enjoyed our self and plan returning next year for another vacation. The staff was so helpful and that is so hard to find these days. Thanks Honeymoon Hills for making our vacation wonderful!!! We did a girls weekend at Honeymoon Hills, we had our honeymoon, and a large family trip for a wedding (that's how we found them). So far we have rented all the creekside cabins, Mountain Paradise and Little Women. These people are great to work with! I'll be back again, I'm sure. They offer great cabins that are so convenient to all the attractions. They've always gone the extra mile to make it a great trip for us. We have enjoyed this cabin so much. The views on-line were wonderful, but in person they are amazing! We actually had Wi-Fi which was an unexpected surprise. Our thanks to the staff and the owners of this beautiful log cabin for our honeymoon. We really enjoyed our stay. The cabin was wonderful. We enjoyed the scenery and the privacy. It was very relaxing, we loved every minute of it! The cabin really made our honeymoon exciting and memorable. Gatlinburg was beautiful. We enjoyed the sites. The staff was very helpful and friendly. We will recommend Honeymoon Hills to our family and friends! My fiance' and I stayed at Little Women cabin. We greatly enjoyed the breathtaking view from any where in the cabin. The cabin was well maintained and clean. It superceded our expectations. We did not leave our cabin the entire time! We love Gatlinburg and are planning our next visit to Little Women. We had such a great experience at Honeymoon Hills. Laurie helped us plan the perfect wedding and honeymoon that fit our wishes as well as our budget. Titania was awesome at the Chapel. She and Laurie really worked with us and cared about our wedding being exactly what we wanted. The Minister seemed to 'know' us by the words he us in the ceremony. The entire experience has been wonderful. We will never forget our wedding ceremony and honeymoon at Honeymoon Hills--great people! We could not have asked for a better way to celebrate our 30th Anniversary. We had a great time hiking in the mountains and visiting so many different activities. Being able to come back to the cabin after a long day and relaxing was wonderful. Thanks for a wonderful stay. We are already talking about our next trip back to this cabin. My husband and I honeymooned at Little Women cabin for four nights. The experience was incredible. The seclusion was exactly what we wanted. The Honeymoon Hills staff was personable, efficient and even picked up a loaf of bread at no extra charge during their concierge service. That was very thoughtful of our personal shopper considering we had forgotten when we made our list. There were more amenities provided than we expected. The entire experience was more than we hoped for. The cabin price was very reasonable. Because of that and the services provided, my husband and I have already spoke about returning even before our anniversary. Thank you to the staff of Honeymoon Hills for your hard work. We hope to see you again soon. We really had a great time. Little Women cabin was amazing. The view was amazing. Our family absolutely loved this place from walking in throughout our entire stay. The kids especially loved it. We would definitely come back and would reserve Little Women again. Also, we reserved Lumber Jack Feud Show with our VIP Entertainment Passport. Checkout for that was very nice and easy. The show was great! Thank you. The trip to Little Women was just to relax for vacation. There people are very good at responding quickly to any situation so you will always be safe. The upstairs bedroom for this cabin was amazing. Having TV’s in every room with lots of channels was convenient. Gatlinburg was fun to relax and walk around. Attractions that were a lot of fun were Wonderworks and Pigeon Forge. Be sure to check out the Mirror Maze. The Hard Rock Cafe and dinner shows were fun too. We had no trouble finding our cabin thanks to the wonderful directions you provided. The cabin was beautiful and clean. The area was very peaceful and serene. 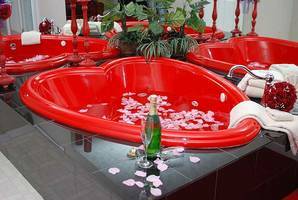 A very romantic place to unwind. You made our honeymoon better than we could have ever imagined! Thank you so much! Our cabin was Little Women. It was a very nice and pleasant trip. Too short of a stay! We must do it again and very soon. I loved the view of the mountains and the town. I really enjoyed myself! When we were looking for places to honeymoon we wanted our experience to be secluded, romantic and adventurous. We found all of those things in Gatlinburg. We stayed at Honeymoon Hills and we chose the cabin Little Women. The cabin sits far back in the mountains and we found that our four wheel drive vehicle was very helpful. When we opened the cabin door it was very warm, cozy, inviting and accommodating. Everything that was advertised on the website was in our cabin. Once we settled into our cabin we found it very easy for us to find something to do during our stay. We took an entire day to go shopping and visit all the little shops that Gatlinburg had to offer. The coupons that were left on the table including the VIP Entertainment Passport allowed us to take advantage of many opportunities. Ripley’s Aquarium, Believe it or Not, and Guinness World Records was an all day event. We were also able to go to Adventure Zipline with our VIP Passport. The Adventure Zipline gave us 2 guides, Sterling and Mr. Martin, who made the experience more memorable. We took the Tram to Ober Gatlinburg and were able to see Gatlinburg from 1500 feet! We also took an entire day to go hiking and have a quiet picnic at Cade’s Cove. We went to Cade’s Cove and saw Laurel Falls as well as Abrams Falls, watching nature go by as we traveled on the Motor Trail Loop. Our favorite places to eat were Crystelle Creek Grill (highly recommend it). They had great food at reasonable prices and had live entertainment nightly. We also went to Blaine’s Bar and Grill. They had great St. Louis style ribs. We also went to Best Italian for great Alfredo. 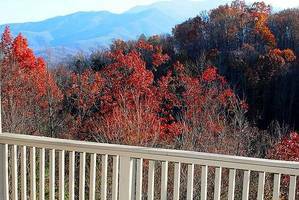 We recommend Gatlinburg, Honeymoon Hills to everyone and look forward to another vacation here. What a wonderful vacation at Little Women. Everything was perfect. The amenities were more than expected. The bed was very comfortable, everything was clean and relaxing. Thank you so very much for the atmosphere that really made the experience very enjoyable! My husband and I stayed at Little Women. It was very clean and cozy. It was very off the beaten path and quiet. The sunrise was nice from the porch. Turning around in the little driveway was a challenge but after the first time or two I had it down pat. 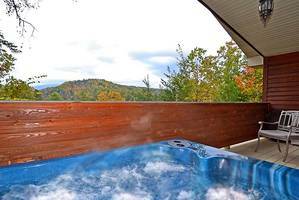 It was just far enough out if Gatlinburg that once you had finished everything you wanted to do for the day picked up supper and headed in, you could sit in the hot tub outside or the spacious tub in the master bedroom. Lots to do if you wanted to or just sip a drink and read a book. Our trip to Gatlinburg was a getaway vacation. We went to Ripley’s Aquarium, Lumberjack Feud Dinner and Show, Lazerport Fun Center, Hollywood Wax Museum and Country Tonight. All of the attractions were great but we would highly recommend Lumberjack Feud and Country Tonight. We enjoyed walking and shopping the Gatlinburg strip. We enjoyed our breakfast at Flap Jacks. It was great! We also enjoyed the meal we had at the Applewood Grill. The service was fast and friendly at both locations. We were looking for a secluded, peaceful retreat. Tucked into the side of a mountain on a quiet lane, Little Women filled the bill. 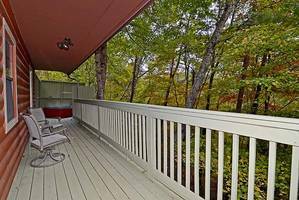 Our favorite aspect of the cabin was the deck where we could sit and gaze out on a beautiful vista of the mountains through the tree tops. It was cored so that if it rained, as it did when we were there, we could still sit on the deck and enjoy the mountain views. While the location is rustic, the cabin itself was charming and modern. You can curl up in the over sized comfy furniture and read or watch TV in the living area with the loft and fireplace. The bathrooms were sparkling clean and there were king sized beds and a jacuzzi. We enjoyed cooking and eating a quiet dinner rather than the hustle and bustle of Gatlinburg. Clean-up was a breeze using the dishwasher. The cabin was very convenient and close to everything, yet very private! Little Women cabin was an awesome cabin. We can’t wait to come back again next year! The Little Women cabin was paradise! So much to do and we enjoyed every moment. Next time we will stay longer. We were celebrating 33 years together and had a beautiful time. Our best vacation ever! We had a wonderful time at the Little Women cabin. 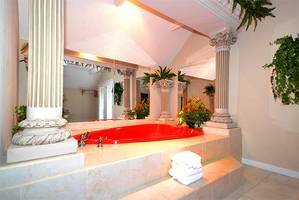 The jacuzzi in the bedroom was incredibly relaxing. The cabin was the perfect distance from Gatlinburg, not a long drive at all but far enough to feel remote and private. The cabin was equipped with everything we could have needed. My fiancé and I went for a vacation from our wedding planning. We wanted to relax and focus on us. We left the cabin feeling like a home away from home. We’ve made plans to return to the mountains!